With introduction of its Black line of riflescopes last spring, Nikon Sport Optics made a bold move into the worlds of precision long-range rifle shooting and long-range hunting, as well as action-shooting for enthusiasts of modern sporting rifles based on the AR-15 and similar platforms. Satisfying the needs and desires of the most critical users demands excellence. Thus, when the Black line was expanded to include a laser rangefinder, I looked forward to testing one with great expectations. The very first animal I ranged with the new Nikon Black RangeX 4K was a black beef cow. To my surprise and sheer delight, the reading came back instantly on the very first try: 891 yards. This is simply outstanding performance! After 60 days of thorough field-testing, I believe this unit is the best compact rangefinder that I have ever used. Kudos Nikon! I’ve noted in previous rangefinder reviews for 1800GunsAndAmmo.com that my daily commute, through the White Mountains of eastern Arizona, affords great opportunity for me to test optics on a number of game animals, cattle and horses. Variable weather – from clear to cloudy, still to windy and dry to wet – at elevations from 6000-10,000 feet, provide excellent conditions for testing and hunting simulation. Although the new Black RangeX 4K was designed for long-range hunting applications, I believe that hunters of all types – big game or small, rifle or bow – and target shooters alike, will appreciate the many features and functions of this excellent rangefinding optic. This rangefinder is super-quick, returning a measurement reading in 0.3 seconds! HYPER READ is Nikon’s name for the function that produces this lightening fast response, regardless of distance. 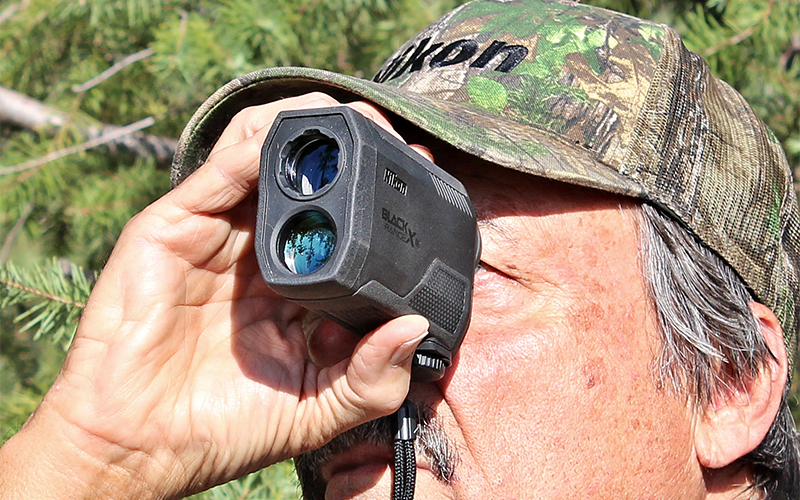 Long-range target shooters and hunters will appreciate this feature. It should be noted however, that using the continuous measurement function on difficult to hit targets can actually pose a problem. With your eye focused on the target mark during continuous ranging, a single distance measurement can flash by too quickly for your eye to move down to where it’s displayed in the viewer so your brain can recognize the distance. Single or continuous measurement – Holding the ranging button down provides continuous measurement for up to 8 seconds. This feature facilitates ranging moving targets, as well as small targets that are difficult to hit. It is also useful to bowhunters for precise shot placement at close range, particularly with animals that are fidgety. A red OLED internal display facilitates easy viewing under any lighting conditions. An automatic brightness adjustment function tunes display brightness according to the surrounding ambient light level. I find this feature useful in all but the brightest and darkest conditions, where the display was easier for me to read when the highest (4 or 5) and lowest (1 or 2) of the 5 different intensity settings, respectively, were manually selected. Tru-Target Technology is Nikon’s term for first or last target priority. This feature is useful to both rifle and bow hunters for measuring overlapping subjects – like elk in timber – or when brush partially hides the target. I find that first priority mode works great for small, unobscured targets like prairie dogs. Last priority mode is particularly useful when reflective objects like rocks or tree trunks are closer than a less reflective target like a game animal. Same holds true for squirrels hiding in tree branches. Target shooters will find this feature useful when confronted with multiple targets, particularly at distance. The angle compensation feature that Nikon calls ID Technology (Incline/Decline) provides user selectable “actual” or “horizontal” distance to the target. This feature compensates for uphill/downhill shot angles as steep as 89 degrees (up or down). I tested the accuracy by comparing readings from the unit to my calculations using Pythagoras’ theorem for a right-angled triangle. Out to 100 yards from an elevation of 60 feet, the readings were precise. This excellent feature is especially useful for rifle hunters in mountainous terrain, as well as bowhunters in treestands. 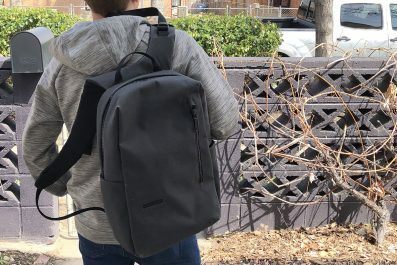 The compact body doesn’t have any curves or recesses that would make you think it was designed for single-handed use but nevertheless, it’s lightweight (6.3 oz. without battery) and easy to hold steady with one hand. Measuring 4.3” x 2.9” x 1.6” (Length x Height x Width), the Black RangeX is a little longer than Nikon’s new Monarch 3000 Stabilized rangefinder. I find the extra length and rectangular shape allows a rock-solid 2-handed hold for measuring targets over 1000 yards, often on the first attempt. The on/off/ranging button is positioned on top in tandem with the mode button, and they are spaced well apart. Bright Nikon glass with 6-power magnification, large 21mm objective, and wide field-of-view (7.5 degrees) combine to facilitate viewing and quick target acquisition. 18.3mm of eye relief is ample for eyeglass wearers, and image sharpness is enhanced with an adjustable diopter. The target mark is clear and uncluttered, which facilitates first try measurement. 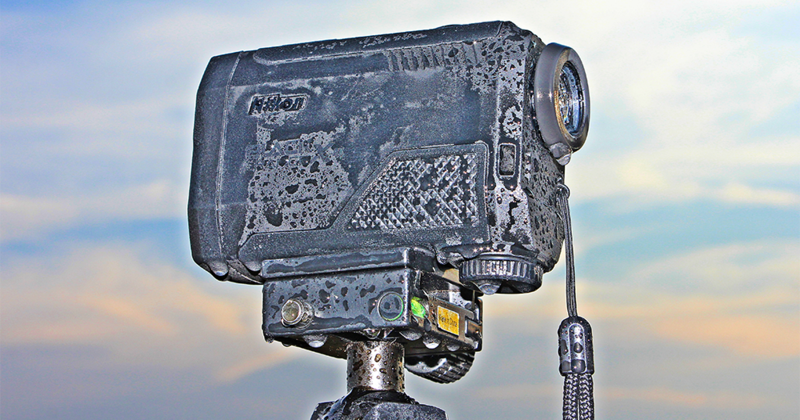 The unit is both fogproof and waterproof, and tested fully functional during light to moderate rainfall. 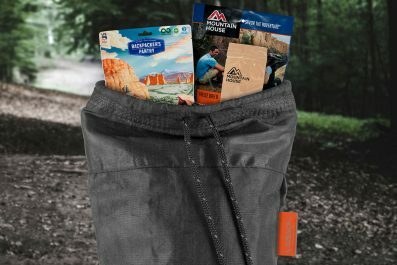 Accessories include nylon carrying case, adjustable neck lanyard & small carabiner type attachment clip. Regarding performance, the first item of note is the new Black RangeX 4K does not have an image stabilization function like Nikon’s other new rangefinder, the Monarch 3000 Stabilized. This ground breaking feature was introduced last year in the Monarch 7i VR Rangefinder, with major fanfare. So… is this a problem? Not at all! 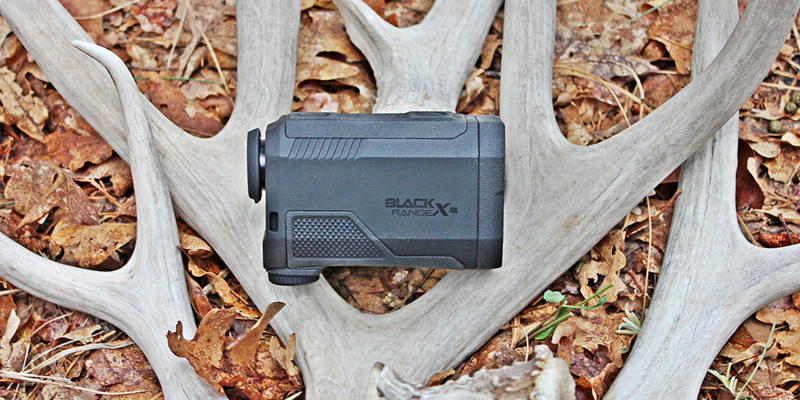 Although I find the image stabilization feature to be quite useful in the M-3000-S, I prefer the Black RangeX with its more powerful laser and receiver, and well-designed body that facilitates a rock-solid hold with two hands when necessary. Although I believe Nikon’s intent was to build a following among long-range target shooters, if I could have just one rangefinder for the remainder of my hunting days, the Black RangeX would do quite nicely, thank you! 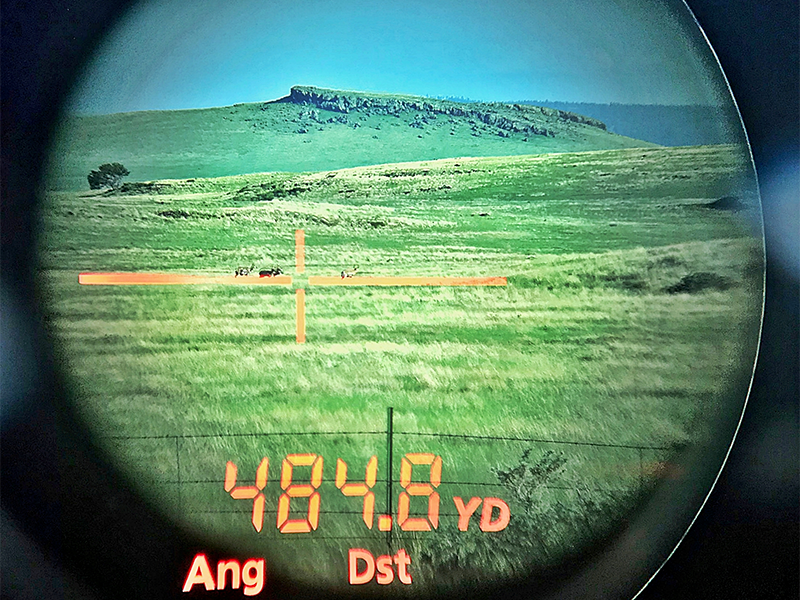 Ranging distance seems to be the big deal in the rangefinder market these days, with manufacturers making outrageous distance claims for “highly reflective” targets that are of no practical use to hunters in the field. And, let me be the first to acknowledge that I have criticized manufacturers, including Nikon, for doing so. Technical specs for the Black RangeX list a “measurement range” of 10-4000 yards, with a claim that the unit is “… engineered to deliver over 2 miles of ranging capability.” Notably missing are the asterisks and “under special conditions” disclaimers that usually accompany such lofty claims. Some reports indicate the Black RangeX can in fact measure big shiny skyscraper buildings more than 4000 yards away. Unfortunately, skyscrapers are in short supply in the mountains where I live, and I have made no attempt to identify the maximum distance the Black RangeX will measure. Frankly, distance measurement capability in excess of 1000 yards is simply of no practical use to 99+% of all hunters. This data shows the Black RangeX 4K will range animals well beyond 1000 yards under favorable atmospheric conditions. Measurements under 1000 yards were often obtained on the first attempt – a fact that will be appreciated by anyone who has struggled with finger fatigue after depressing the ranging button dozens of times to get a single reading with a less capable compact rangefinder! 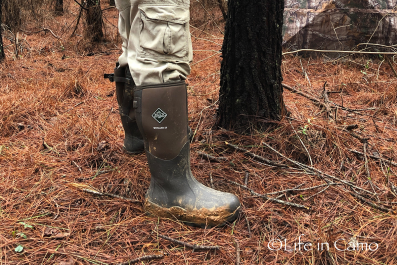 It’s important to note that wind and light rain reduced the measurable distance considerably for two particular targets – brown beef cows and large pine tree trunks. It was possible to measure distances to these two common objects on multiple occasions under a variety of weather conditions. 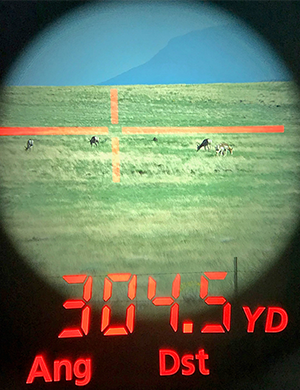 Measurement Capability – Quickly and accurately measuring distances of nearly a mile on target animals, often on the first attempt, is a noteworthy feat for a compact rangefinder. Hand Held Stability – Although the Black RangeX can be held remarkably steady with one hand, a rock-solid hold can be achieved with two hands, facilitating first try measurement on easy targets and reasonably quick readings on difficult to hit targets. Continuous Ranging – The more I use this feature, the more I appreciate it. With distant, small and/or moving targets that I know will be difficult to hit, I typically hold the ranging button down while passing the target mark across the subject. This technique produces a reading almost every time on animals inside 1200 yards. 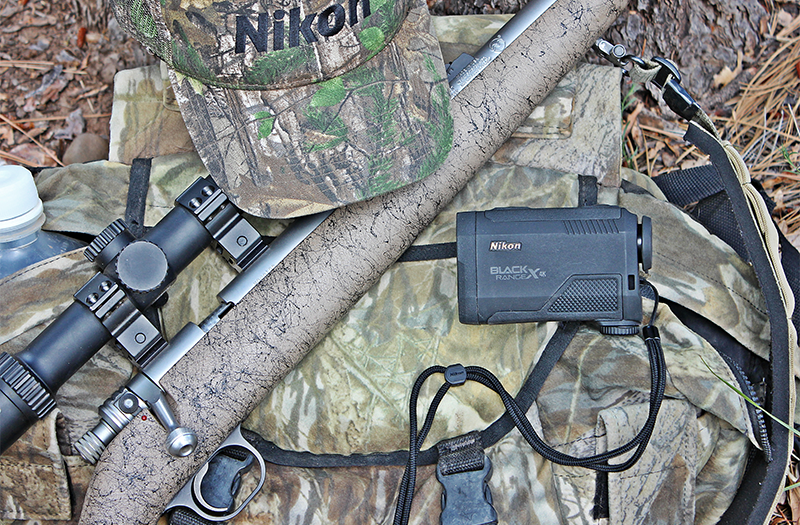 Angle Compensation – This feature is accurate and invaluable for hunters in situations where an uphill or downhill angled shot might be taken. I keep this feature turned-on to display the “horizontal” distance at all times while in the field, as the “actual” distance to a target is practically insignificant while hunting. Price – This may just be the best feature of all. With an MSRP of $449.95, and sale prices well below that figure, the Nikon Black RangeX 4K is a great rangefinder value, whether on sale, or not. Eye Relief – With 18.3mm of eye relief, positioning the eye behind the ocular to obtain a full field-of-view requires some practice. Eyeglass wearers don’t seem to be affected but with bare eyes, some spacing is required for a full view, and it’s difficult to maintain precise spacing while hand-holding and activating the unit. This problem could be solved with an adjustable eyepiece similar to those found on binoculars, or more simply with a collapsible, soft rubber eyecup that would maintain proper spacing through resistance, when pressed against the eye socket. Carrying Case – This is a comparatively minor knock, but like other Nikon rangefinder cases, this one has open void areas that allow dirt, dust and rainwater to enter. One of these voids exposes the screw-on lid to the battery compartment. This design is far from ideal for hunting in the elements. The Nikon Black RangeX 4K Rangefinder lives up to the Nikon Black standard and delivers as promised. This unit is without peer in the under $600.00 compact rangefinder class. It can be expected to excel in virtually all hunting applications for bow and rifle. It will also function exceptionally well in target shooting applications out to distances of two miles (provided the target is large!). Other than the eye relief issue noted above, the only improvements I would recommend are greater magnification and addition of a recessed tripod adapter. Increasing magnification from 6x to 8x would enhance usage on subjects at longer ranges, and I suspect that target shooters would appreciate simple and solid built-in tripod adaptability.